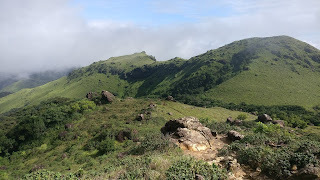 Home / 2 day trek / Bangalore Trekking Club / Bangalore Trekking Club Review / Coorg / Exploration trek to Coorg / fast trek / Tadiandamol / Trek to tadiandamol / Ready to do a fast trek to Tadiandamol??? Ready to do a fast trek to Tadiandamol??? The theme of the trek to Tadiandamol which was organised by Parth P Patel and Gaurav Kamath, Sandeep Paul. The event was scheduled on 3rd June 2017. As soon as the notification buzzed on my phone. I registered for the event and waiting for the response that my name would be shortlisted as this event was only limited to 12 members. My name was shortlisted along with other enthusiastic 11 members and three other members were on the wait-list. So guess I was lucky to be shortlisted. We all assembled at Shantala Silk by 10.15 p.m and I could recognize Shubham , Mrs Veena and Satheesh from previous trek, so it was nice meeting after a period of time. We boarded and commenced the journey. We started with introduction but with a little twist as suggested by Sandeep. We need to repeat the names of the previous members and introduce ourselves. After a brief introduction, further to keep attention it was time for Antakshari. After a brief period, all slipped to sleep. We arrived at Virajapet KSRTC bus stop at 3.30 a.m and freshened up at KSRTC bus stop and resumed journey to Kakkiabe. 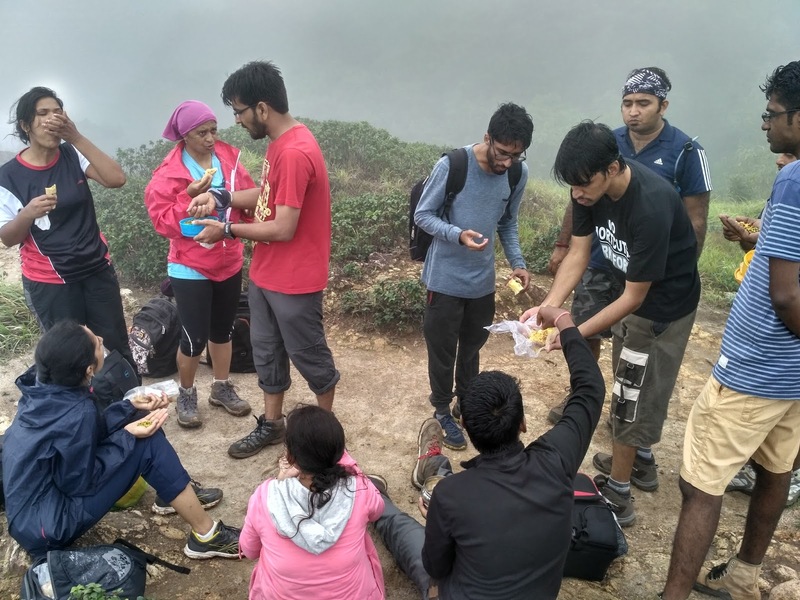 We reached the base around 6.15 and had a breakfast, which was Kellogs Flakes courtesy to the idea of Gaurav and Mrs. Veena. It was time for wearing our trekking shoes. Gaurav begin the instruction part what to do and what no to do and the rules. 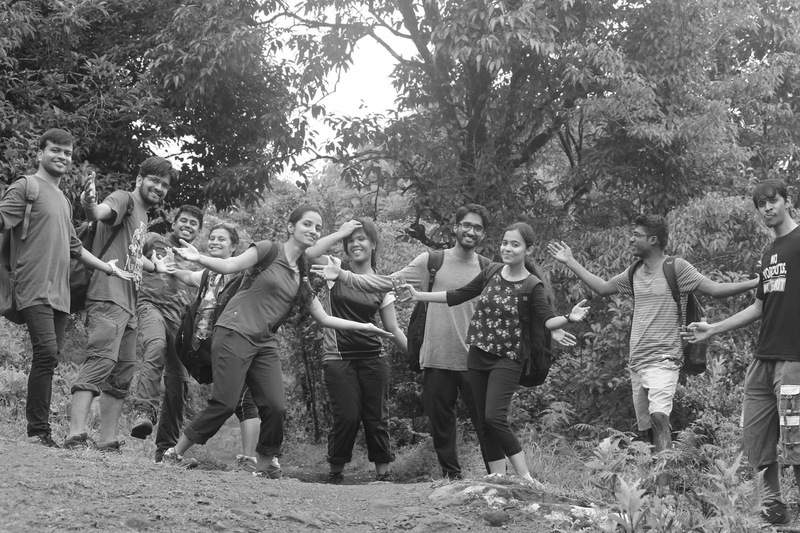 Gaurav would lead the trek, with Parth in the middle and Sandeep at the back of the trial. Trekking commenced and the weather was beautiful and hoped that it would not rain too much and plans were to return to the base by 12.00. 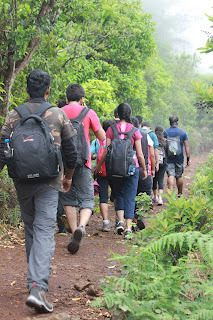 We commenced trekking, all were in actively waiting to see the glimpses of nature what it would provide us. 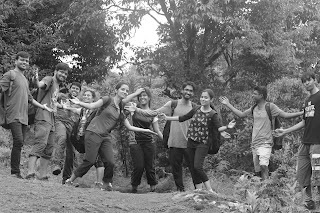 We were trekking enjoying the natural tranquil and weather was awesome and assisted us in trekking. 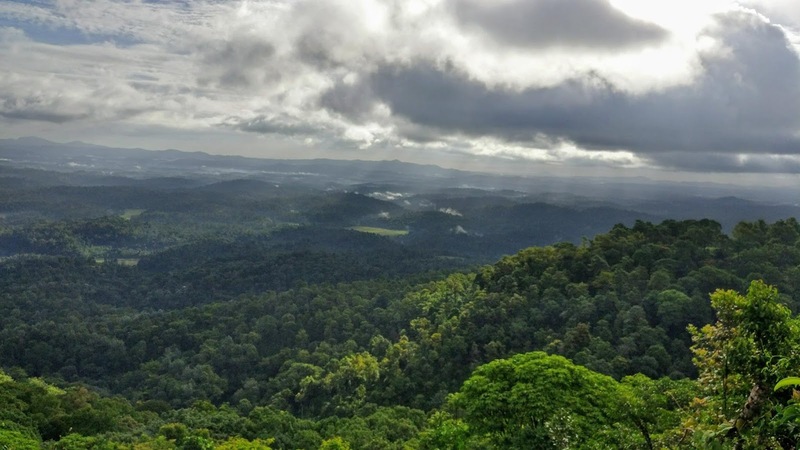 The Sun was at his early stage and with trekking; all the members were enthusiastically clicking selfies and pics and enjoying the serene and the beauty of the nature. We were lucky as we had a view of sunshine, rain, winds and all elements of nature at its majestic. We were enjoying the trekking as the weather did not burden on our energy. We were off the asphalt road and reached a gate and later we hit the mud track and continued our trek and we reached the boulder which was the identifying spot. There were shots of boomerang mini videos near the boulder due to courtesy of Sindhu. We resumed trek enjoying the natural serene and landscape. The meadows present us with most amazing clarity. In the middle of the trail there was a presence of elephant dung. However it was not off recent one, so there was sighing of relief. The trek trial was well laid out so there was no hitch. We entered the Sholay forest range, as it had rained the previous day and we were told to be careful about leeches as it was swarming. We were told not to stop in the forest range as the leech may cling to our legs and continue our trek. The Trek through Forest Range concluded and grass meadow appeared. 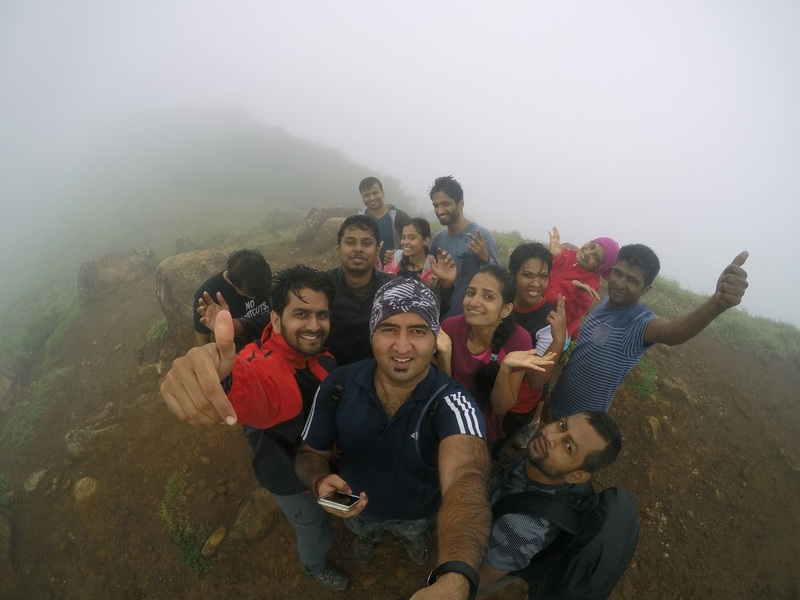 With continuous word of support from organisers, we reached the peak of the mountain. 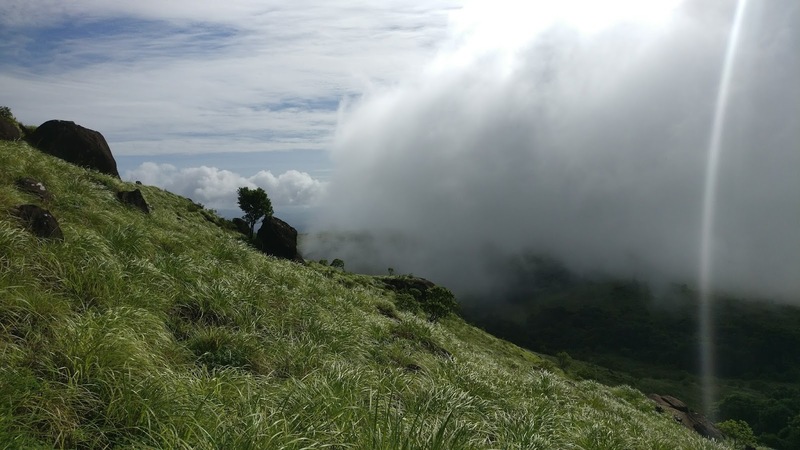 The weather conditions were supporting our trek and the nature with an amazing view. 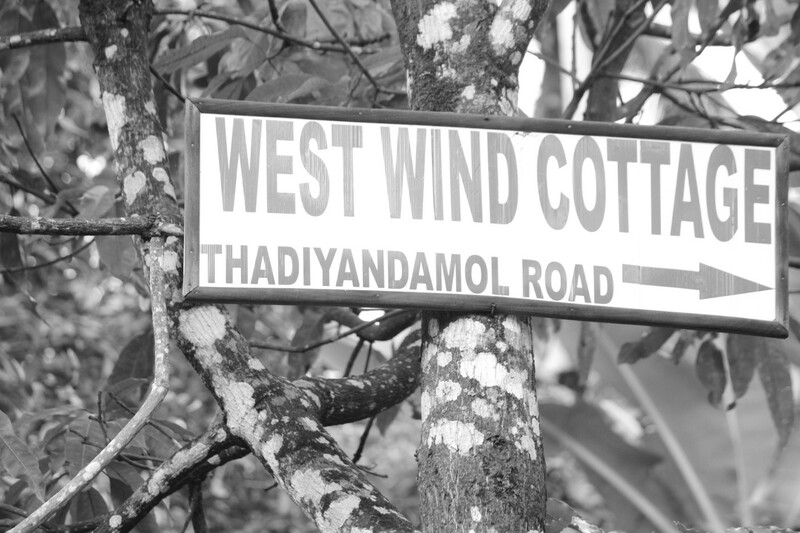 At the top, the cool wind was blowing at our face, the mist, the breeze and drizzling. We were all drenched and Gaurav and Parth suggesting us to wear raincoats or other rain protective gears, but I guess for few minutes no one was paying attention We spent the time at the top . Later it was the time of selfies and pics . Later all the members were shivering so left with no option all had to wear the coats. We spend time at top and no one was interested to descend. Later Gaurav and Parth had to induce us to descend reminding us about the change of weather conditions which may downpour and also visibility sometime was of less distance and not to lead us to further trouble. We started to descend and had refreshments. Parth and Mrs. Veena shared Thepla and Mrs. Veena revealed that she had prepared Thepla by watching videos. It tasted good and in no time, our refreshments were done and resumed our descent. . It started to rain and Gaurav, Parth and Sandeep all advised us to be careful as the ground may be slippery. On descending we saw many trekkers trekking but felt we were lucky as weather conditions was getting worsening. I had a fall but escaped with no injuries. Guarav with constant conversational was lifting up the spirits of the team. We reached the base at 12.30 p.m. Leech had stuck on the leg of mine, Gaurav, Sandeep and Satheesh. We then poured salt on it and in no time it fell. We then cleaned and freshened up. We then started our journey towards Bengaluru and all were little exhausted I suppose but with weather not hard on us, our energy were not drained out, all were in cheerful manner. Our stomach gave us the warning and it was time for lunch. We reached Virajpet and had lunch at Al Noor Resuratant . After having lunch, Parth suggested for games to keep up the spirits alive and it was time for dump charades. We stopped for tea near Hunsur.